Top of the Mornin', and Cheers! Europe is second smallest continent, but is continent with the second most number of countries! Famous landmarks, traditions, and cultures don't only make this beautiful, but also quite diverse. This unit has 9 main reading comprehension passages that covers most of the Tennessee 3rd grade social studies standards. What make these non-fiction texts a little different is the questioning style. 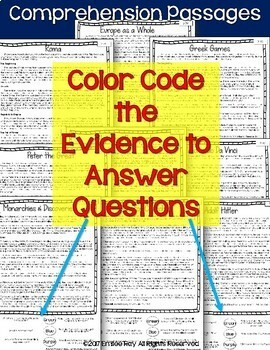 Instead of "Write the answer," students are required to SHOW their answer with text evidence and colors! This set covers most of the standards for Tennessee 3rd grade social studies. 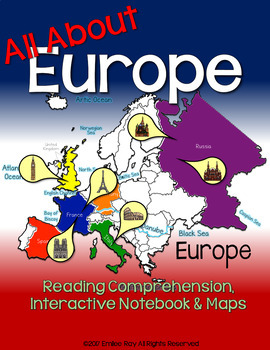 This is easy to grade and encourages deep reading of the non-fiction text. 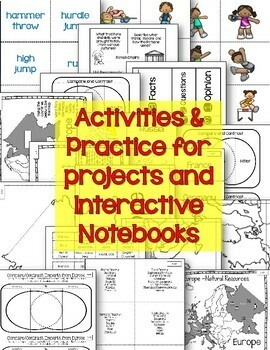 Along with the passages there are activities for students to complete in interactive notebooks and in group setting. So much fun! Let's bring a little life back into social studies! p.46-50 – Europe Poster Project (Label the countries and Waterways. ✈️3.40 Use timelines, primary sources, and historical passages to summarize the history of a region, including events, inventions/inventors, artists, writers, and political figures. (C, G, H, P) Suggestions are as follows: Olympics in Ancient Greece, Roman Empire, monarchies, European discovery of the New World, historical narratives of major European immigrant groups and their journeys to America, and current events. Don't forget to leave feedback. For each dollar spent you get 2 credits for your next purchase on the TpT site, IF you leave feedback. Also, please make sure it is fair feedback. Remember, I am a real person, who isn't perfect. If you find a problem, PLEASE email me first. Most likely, I can get it fixed for you the same day.